ISC West is my favorite time of year! My team and I work all year long for those four days. Our goal is to put on an awesome show so that you can find new products, new vendors, and education to keep your business on the forefront of technology. That said, we know YOU can’t focus on ISC West 365 days a year like we do. And the show is quite large. So, if you don’t plan for it, you may not get as much out of it as you’d like. That’s where I come in. I’ve put together a list of my personal tips for planning for ISC West. Book your travel through the ISC West Website. Every year, I get emails before the show from people who booked with a fly-by-night travel company that faxed them (who uses fax anymore??) before the show. This company in most cases has disappeared and the customers are left without a room. Don’t fall for it!! ISC negotiates rates at the local hotels and we have a lowest price clause in most of our contracts, which means the hotel can’t sell the room elsewhere for less. If you book with our approved vendors, you’re guaranteed your reservation will actually exist when you arrive AND you’ll get a good price. The show is BIG! And that’s a good thing. But, if you don’t have a plan to tackle it, you’ll end up wandering aimlessly for 3 days. Our website and mobile app allow you to view booth locations, create a Short List of exhibitors to visit, and create an agenda of events and meetings, all through My Show. You can even use the Mobile App to help you navigate to each booth and create a route on the Show Floor. If you’re organized, you’ll be much more productive. Visit the SIA New Product Showcase. Talk about taking the hassle out of finding the newest technology! The SIA New Product Showcase is more than a product display area. The products in the program go through a rigorous application process, which guarantees they are new releases to the market. They are also judged by a panel of experts, and awarded in various categories. So you know they are the real deal. The display area is located right outside the Exhibit Hall Entrance along the windows. There are over 65 sessions, including hands-on workshops, that you can attend throughout the event. The technology-focused program is developed by a panel of industry experts and covers the hottest topics affecting the industry today. 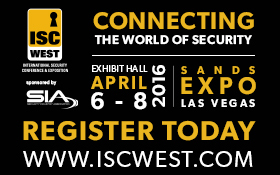 Utilize the ISC West Recommendations Provided to You. Ever wonder what the ISC Team does with the questions you answer while registering for a badge?? New this year, the ISC West My Show tool can make exhibitor and product recommendations to you based on that information. Our sophisticated software matches your product interests with our exhibitors’ offerings to give you dynamic recommendations. Plus, as you utilize My Show, our software will “learn” and you’ll get more customized recommendations. It’s the easiest way to discover something new at the show. Attend Industry Events that Run Concurrently with the Show. ISC West is supported by many industry groups and associations. There are constant events happening in and around the Exhibit Floor. Take advantage of them for more than a free cocktail. The networking and conversations that happen at these events can provide the best learning for you to take home and provide you with a rolodex of people to call when you have a problem later on. Visit our Special Events page for a listing of events. The Security 5/2K Race is a great way to get involved in our industry and make a difference in the lives of children in the US. The race is run before the show floor opens on Thursday (no excuses, you can get up!). You can run with your colleagues, your vendors, the ISC Team, or complete strangers and make new friends. Not only is it great networking, and a great way to recover from the night before, but it’s also for a great cause. The SIA Education@ISC Program is a fantastic value. There are over 65 sessions, including hands-on workshops, that you can attend throughout the event. The technology-focused program is developed by a panel of industry experts and covers the hottest topics affecting the industry today. In fact, PSA Security Network programs an entire track of education at the event, and sits on the Advisory Board, so you know the content is top of the line. If you’re worried about losing time on the exhibit floor, don’t! You can purchase a single-day pass for Tuesday (before the exhibits open). And the session schedule ends early on Wednesday and Thursday, so you’ll still have time on the show floor after your sessions.